"Machine Gun" Jack McGurn (July 2, 1902 – February 15, 1936), born Vincenzo Antonio Gibaldi, was a small-time boxer, Sicilian-American mobster and key member of Al Capone's Chicago Outfit. McGurn was born in July 1902 in Licata, Sicily, the eldest son of Tommaso and Giuseppa Gibaldi (née Verderame). Four years later, he and his mother emigrated to join his father in the United States of America, arriving at Ellis Island on November 24, 1906. McGurn grew up in the Brooklyn slums where he went to Public School 46 on Union street between Henry and Hicks streets. McGurn moved to Chicago when he was 14 where he later took up a career in boxing as a teenager and changed his name to "Battling" Jack McGurn because boxers with Irish names got the better bookings. After Tommaso's death while McGurn was still young, his mother remarried to grocer Angelo DeMory, who was later murdered by Black Hand extortionists. Legend has it that McGurn was first introduced to Capone after his stepfather, Angelo DeMory, was assassinated by gang extortionists on January 28, 1923, and McGurn had methodically avenged his death by killing the three hitmen responsible. In fact, McGurn was already on the Outfit's payroll by the time of DeMory's death, and had probably come to Capone's attention through his budding career as a prizefighter. McGurn had part ownership of a speakeasy jazz club, a venue which still exists today, the infamous Green Mill, at 4802 North Broadway, in the middle of the rival "Bugs" Moran gang's territory. In November 1927, manager Danny Cohen gave McGurn the task of "persuading" comedian/singer Joe E. Lewis not to move his act south to the New Rendezvous Café, at North Clark Street and West Diversey Parkway. Lewis refused, and McGurn slit Lewis's throat, cutting off a portion of his tongue and leaving him for dead. Miraculously, Lewis eventually recovered and resumed his career, but his voice never regained its lush sound. McGurn is associated with planning the St. Valentine's Day Massacre, in 1929, though this association has not been proven. Although police charged McGurn in the case, he was never brought to trial largely due to his "blonde alibi"—girlfriend and later wife Louise Rolfe—who claimed they spent the whole day together. In April 1930, when Frank J. Loesch, chairman of the Chicago Crime Commission compiled his "Public Enemies" list of the top 28 people he saw as corrupting Chicago, McGurn's name was fourth on the list, which was published nationwide. This notoriety caused him to be shunned by the Outfit. So McGurn, who had great hand-eye coordination, attempted a career as a professional golfer. McGurn was a silent partner in Evergreen Golf Course, at 91st Street and Western Avenue, a known mob hangout where McGurn could often be found playing, practicing, giving lessons, or drinking and playing cards in the clubhouse. Dan Lilly was known to have caddied for him once and claimed that he kept a machine gun in his golf bag at all times. On August 25, 1933, the Western Open golf championship began at Olympia Fields Country Club in the far south suburb of Olympia Fields. A reasonably skilled golfer and flashy dresser, McGurn entered the competition as Vincent Gebhardi (another version of his real name), the professional at public Evergreen Golf Course. In the opening round, McGurn carded a 13-over-par 83 on course No. 4 (today's North Course). The next morning, the name "Gebhardi" on the day's pairing sheet was observed by an alert Chicago Police chief detective, who sent two sergeants to arrest him. "Aware of McGurn's truculent temper," the Chicago Tribune account reported, "the sergeants enlisted the help of Lt. Frank McGillen and five policemen from the Homewood station of the county highway force." McGurn was playing much better the second day. The group of burly officers accosted McGurn on the seventh green and told him he was under arrest under a warrant issued the day before under the "criminal reputation law". He was accompanied by his wife, the glitzy "Blonde Alibi" Louise Rolfe. Wearing a tight, thin white dress and sporting a three-carat diamond ring, she approached the policemen and snapped, "Whose brilliant idea was this?" McGurn politely asked to finish his round. Amused, the plainclothesmen agreed and became part of his gallery. But the police presence began to unnerve McGurn and his game suddenly went sour. He came in with a 16-over-par 86 for a 36-hole total of 169, 14 strokes above making the cut. Less than three years later, McGurn, by then impoverished and abandoned by his fellow gangsters, was assassinated by three men with pistols on February 15, 1936, one day after the seventh anniversary of the St. Valentine's Day massacre. He was bowling at the second-floor Avenue Recreation Bowling Alley, at 805 N. Milwaukee Avenue in Chicago. The killers tossed a Valentine card with this ironically prophetic poem near to his body: "You've lost your job, you've lost your dough, Your jewels and cars and handsome houses, But things could still be worse you know... At least you haven't lost your trousers!". He was laid to rest at Mount Carmel Cemetery in Hillside, Illinois. On March 2, 1936, McGurn's half-brother, Anthony De Mory, was killed in a manner similar to McGurn. De Mory, who had claimed, "I know the guys who killed Jack. I'm going to get them," was shot by three masked men in a Chicago pool hall. Police linked the assassination to McGurn's slaying. 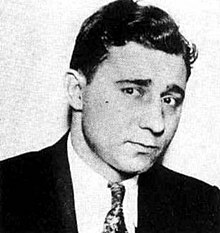 The identity of McGurn's killers remains unknown, but research and speculation by criminologists suggest three possible theories: revenge by George "Bugs" Moran, whose men McGurn had planned to kill almost seven years to the date before, or the South Side mob under Frank Nitti, because McGurn (a heavy drinker and a braggart), had become a liability due to his intimate knowledge of the Outfit. There is also the notion that McGurn was killed by James Gusenberg, the brother of Frank and Peter Gusenberg, who were two of the victims of the St. Valentine's Day Massacre. McGurn has been portrayed in several movies including The St. Valentine's Day Massacre (1967) by Clint Ritchie, Capone (1975) with Carmen Argenziano, The Verne Miller Story (1987) by Frank Costa and Gangster Land (2017) by Sean Faris. He was also played by K.L. Smith in the original The Untouchables television series and by Paul Stevens in the Playhouse 90 episode "Seven Against the Wall", depicting his role in the St. Valentine's Day Massacre. McGurn's attempted killing of Joe E. Lewis was later immortalized in the movie The Joker Is Wild (1957), with Frank Sinatra as Lewis. Ted de Corsia is Georgie Parker, (Danny Cohen) and Leonard Graves is Tim Coogan, (McGurn). ^ Atti Di Nascita for Vincenzo Gibaldi, Tribunale Di Agrigento, Provincia Di Agrigento, Citta Di Licata, July 2, 1902. ^ a b "'Machine Gun' McGurn Is Slain in Chicago. Linked to St. Valentine 'Massacre' of 1929". The New York Times. February 15, 1936. Retrieved August 15, 2012. Gangland early this morning observed the seventh anniversary of the St. Valentine's Day massacre by assassinating "Machinegun Jack" McGurn, one-time leader of the old Capone gang, who was suspected of participation in the killing of the seven men in a North Side garage in 1929. ^ The Associated Press. "Gangland's guns flash death again", The Fairbanks Daily News-Miner. March 3, 1936. Parr, Amanda J. (2005). The True and Complete Story of Machine Gun Jack McGurn. Matador. ISBN 1-905237-13-8. Gusfield, Jeffrey (2012). Deadly Valentines: The Story of Capone's Henchman "Machine Gun" Jack McGurn and Louise Rolfe, His Blonde Alibi. Chicago Review Press. ISBN 978-1613740927. This page was last edited on 8 April 2019, at 18:06 (UTC).